People come first for Australian small business. There’s a plethora of heart-breaking AFL grand final ticket stories this week. The Western Bulldogs last made the grand final 55 years ago, and its last premiership was 7 years before that. Supporters whose PARENTS weren’t even born then are scrambling for tickets, while over 30,000 members are missing out altogether. There are also some good stories that reflect well on Australian small business. Lynda Charles has been a member of the Western Bulldogs virtually her whole life, as was her father Mick Collins. He passed away a few years ago on the bus coming home from a Bulldogs game. His was a Footscray Bulldogs family through and through. His cousins, the famous Collins brothers Allan, Jack, and Robert, all played with Footscray in the VFL as it was then. Alan also played with my Dad at Williamstown in the 1948 VFA grand final. However, it was Jack who became the champion. He’s the Footscray Hall of Famer, named in the team of the 20th century, twice the league’s leading goal kicker, and scorer of a then-record 7 goals in the 1954 VFL grand final. To date it’s still the Bulldogs’ only premiership in the VFL now AFL. This year Lynda booked to go on a dream holiday to America on the morning of the grand final. 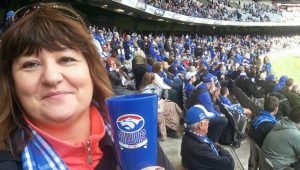 “I honestly thought we had too many injuries to get to and through finals.” However, she travelled from Melbourne to the Sydney Olympic Park last week to see the Bulldogs win through to the grand final. Within moments she changed her overseas flight, leaving her husband to fly ahead of her. Like all 40,000 Bulldogs members, Lynda was hoping for a grand final ticket via the club ballot. The club was allocated just 15,000 of the 100,000 MCG capacity. Disappointment was inevitable and Lynda missed out. She resigned herself to watching the game on a big screen at the Western Oval. “My boss has just called and said that he has got me a ticket… OMG,” Lynda excitedly announced on social media. Tony Hill, the owner Trident Toilet Partitions at Tullamarine, had dipped into his own pocket and tracked down the hottest ticket in town for his newest team member. Lynda is one of only 8 employees. She’s been a bookkeeper there for just three months, and part-time for most of that time. But to Tony, every employee is valuable. “He always says he is not in business just to make money, he loves the interaction with staff and customers,” Lynda said. You’ll see Trident installations right across Victoria, including Federation Square, Crown Casino, Melbourne Museum, Werribee Zoo, and even Port Phillip Prison. You’ll also see Lynda at the MCG this Saturday. Courtesy of Tony, one of the great bosses of Australian small business. Harold Peacock also writes a history blog History Out There which includes more stories like this. Good onya Tory, one of the great bosses of Australian small business. I hope you set an example to much of your cohort by paying your employees the legal rate of pay, including the appropriate penalty rates for unsociable hours.